Well, I guess Better Things addressed that whole closure thing from last week, didn’t it? To be clear, Sam isn’t considering getting back together with Xander, but she is still leaving room—scratch that, a whole garage—for him in her and the kids’ lives. As the end of her spousal support of her ex draws near, you’d expect Sam to be elated, and she is. But though it takes her some time to remember it, she’s not the type to actually leave someone in a lurch. Even if it’s someone who has never taken more than a passing interest in their kids, who left Sam a single mother well before they got separated. There’s an important distinction in “Arnold Hall,” though—it’s not really Xander she’s helping but Max, Frankie, and Duke. She almost certainly pities Xander, but Sam’s no mere pushover. She is very put-upon, but she doesn’t think for one moment that continuing to support her ex financially will have any positive effect beyond keeping him alive and intermittently involved. And the truth is, despite the impressive case the eponymous Arnold Hall (Rade Serbedzija) makes for his pathetic son, Sam’s probably always known that she would have to look after him like she does everyone else. It’s a frustrating realization, not least of which because it comes after that amazing one-woman chorus of no’s from last week. 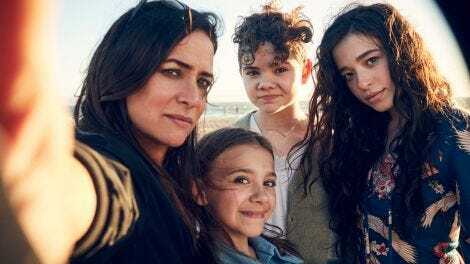 But Pamela Adlon takes us through that decision in an alternately soul-crushing and lively episode. She even manages to build a little suspense before ending with Sam’s latest resignation. The first time Sam opens the garage door this episode, it’s after her co-star warns her that even after the alimony dries up, your ex never really goes away. Her dark eyes survey the stacked boxes and containers, the bikes and bar stools. It’s an unassuming yet clever set piece—it offers tangible proof of how full her life already is, and suggests there’s no way she could possibly accommodate anything or anyone else. It’s a physical manifestation of Sam’s many responsibilities; we don’t see the labels on those containers, for example, but they could very well read “dinner prep,” “Duke’s lunch,” “see Phil at the hospital,” etc., etc. The amount of care Sam gives her kids basically makes her a stay-at-home mom, but she’s also a full-time working actor, great friend, and a pretty good daughter. Adlon works just as efficiently behind the scenes as she does in character, making excellent use of visual metaphors and various Los Angeles landmarks (I’m not from LA, but my guess is she was in the Philharmonic’s rehearsal space/concert hall). Here she uses clutter to represent Sam’s priorities, and a literal extension of her home to symbolize her continued support of Xander, as well as the boundaries (we finally have some!) she’s trying to set. But, as ever, her performance is the biggest draw. 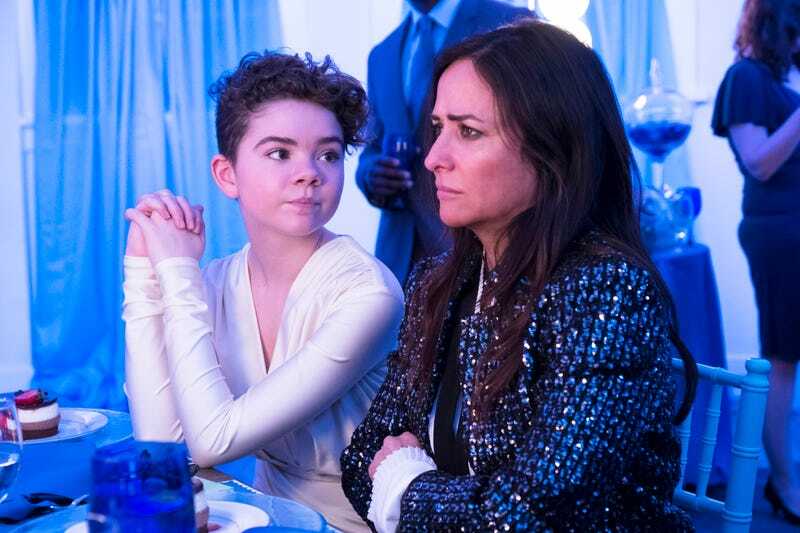 The way Sam endures abuse is demonstrated throughout, from Arnold’s gross insistence that she keep looking after his family (while throwing up his own hands about Xander’s well-being) to Frankie’s onslaught at Push’s bar mitzvah. She weathers it all, but Adlon’s expression always captures the toll these acts take on her. The too-nice woman is back, but maybe not for long. The flip side of “Arnold Hall” is all about rites of passage, with a nod to chosen families. Push’s bar mitzvah is as much about his move into adolescence/adulthood as it is Frankie’s. As Sam notes, they’re the same age, which might be why Sam (and the viewer) is forced to sit through that barrage of insults. Frankie seems the most attached to Xander, so I did briefly think that her nasty comments to Sam were somehow brought on by overhearing or catching on to her mother’s resentment. But maybe, and this is just a theory, teenagers are just awful? And now that Frankie is one, she’ll behave even more abominably toward Sam? Sam is very much the heart of this show, so it’s painful to watch her get dumped on so much in one episode. I know, that happens in virtually every episode, but Frankie’s attacks appear to come out of nowhere. What’s interesting is that when Sam does retaliate, it’s in immature ways, like dumping cake and water on her daughter. She’s never been above such things before, but she relies solely on these juvenile stunts in response to Frankie’s cutting remarks about the passage of time. But as the dust settles, we realize how Sam could take this (mostly) in stride. It’s because she’s been through it before, with Max. Sam has a different set of issues with her eldest now, but she’s familiar with teenage barbs (she probably dealt plenty of them to Phil in her youth). So when she takes another look at that cluttered garage, it’s with renewed vigor. More than anyone else, Sam has got this. Whoever played Sunny’s sister bears a striking resemblance to Alysia Reiner, so good job, casting department. Sam’s exasperated “Yes!” in response to Arnold’s suggestion that Xander would take his own life instead of trying to take care of himself pairs nicely with “Blackout’s” no’s. And it stays true to the way Sam responds to being backed into a corner in “Rising,” when she snaps at Fedora Fella. The bar mitzvah speech made me wonder whether Frankie will also get this rite of passage treatment. I want Sam’s sequined jacket and Frankie’s velvet/velour Oxfords, please and thank you. Should we take Phil’s continued absence as a good sign? There was no narrative reason for her to appear this episode, but it’s still a little disconcerting to not get an update on her after the hospitalization.